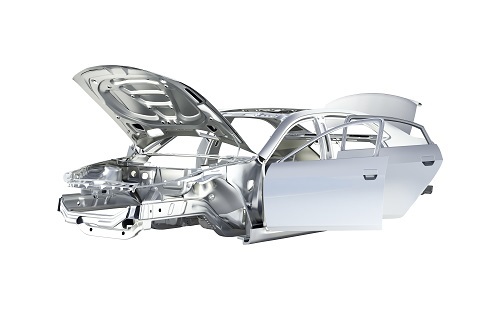 Aluminum — long the material of choice for aerospace, European automotive design and other industries — is being rapidly embraced by North American automotive designers for its high strength-to-weight ratio, light weight and corrosion resistance. However, aluminum exhibits different characteristics than steel that require a Systems Engineering approach to unlock maximum value. Systems Engineering provides an open exchange of ideas directed at a common goal: Developing the aluminum alloy best capable of achieving functional and regulatory-related design goals while optimizing manufacturing efficiencies to meet cost and timeline requirements. Systems Engineering takes a lifecycle view of material development. It integrates R&D, production and management engineers into a single team responsible for designing and managing customer-driven solutions. This cross-disciplinary team of engineers collaborates from the outset, reducing time to market and improving responsiveness to customer objectives. In Systems Engineering, material development engineers work closely with the internal automotive design team to clearly define each functional element of design. For example, the automobile may require the sharp lines characteristic of steel-based profiles, significant reductions in overall weight, a high level of impact resistance and/or optimum recyclability. Consider the challenges involved in choosing the best material for an automotive closure, such as doors. The manufacturer has already determined that steel cannot meet the weight requirements necessary to comply with environmental regulations, so an aluminum processor is consulted. But which alloy to use? Material development engineers work with production engineering to evaluate various alloys, dies and stamping methods to ensure the safety and robustness of the resulting design. Cost analysis: A mix of 5000 series material for the inner door and a 6016-based alloy for the outer panel are most commonly used today, but new 6000 grades can meet inner door formability requirements. Applying an industry-recognized cost model shows a door design using 6000 inner and outer panels can yield a slight weight and cost savings when all factors are considered. 7000 series aluminum also has shown promise for door beam structures, providing a further weight savings over press-hardened steel beams. Stamping optimization: Compared with steel, aluminum exhibits a very rapid strain hardening response. Special care must be taken in designing draw beads that allow maximum stretch for outer panels. 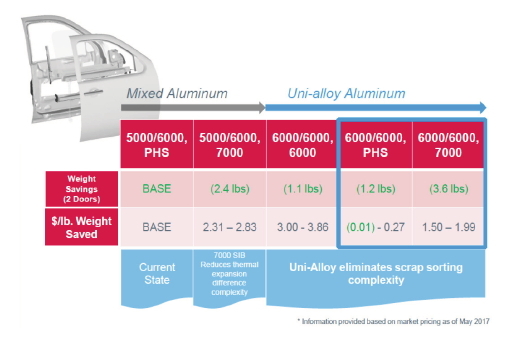 In addition, new higher-formability grades of aluminum support unialloy closure concepts. Through simulations and actual press trials, similar — and sometimes superior — formability can be achieved. Other considerations: Even when desired cost, formability and surface quality are met, other influences should be assessed to optimize overall closure system requirements. Weldability/joining behavior, corrosion control and tribology specifications are examples of other key factors that should be assessed in detail.